Greetings again from the darkness. A good guy doing bad things for a good reason. A bad guy doing bad things for a good reason. A good guy whose make-up doesn’t allow for bad things by anyone for any reason. 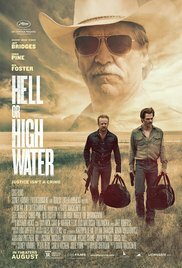 Director David MacKenzie (Starred Up) and writer Taylor Sheridan (Sicario) serve up a quasi-western featuring a crusty old Texas Ranger doggedly pursuing two bank robbing brothers. If not for the numerous destroy-the-flow screaming political statements, this could have been a near instant classic – just a tick below No Country for Old Men. Chris Pine and Ben Foster play brothers Toby and Tanner Howard. Details eek out slowly about each … most importantly that Toby is a divorced dad and Tanner is an ex-con. Toby has meticulously planned out their bank robbery spree. The goal is to save his family ranch so his boys can escape the “disease” of poverty. Tanner is along to support his brother … and probably because he enjoys the adrenaline rush. Soon enough, Texas Ranger Marcus Hamilton (Jeff Bridges) is on the trail of the boys, and his highly developed instincts and gut feelings annoy his partner Alberto (Gil Birmingham) almost as much as Marcus’ incessant and insensitive racial teases – a reminder of the days when buddies would verbally jab each other without the risk of class action lawsuits. The performances are all excellent. Pine is the quiet guy resigned to a life without happiness, but refusing to give up on his boys. Foster is the wide-eyed trouble-maker who long ago realized he would always be one careless moment from the end. Bridges literally becomes the Ranger being forced into retirement (age) but intent on remaining somewhat relevant. Additional support work is also quite colorful in a west Texas kind of way. The wonderful Dale Dickey gets an early sequence with the boys, the great Buck Taylor is always a pleasant presence, Margaret Bowman adds yet another memorable character to her resume as the T-Bone waitress, and Katy Mixon (“Eastbound and Down”) gets to stand up for the little people. West Texas is a character unto itself with massive poverty, oil pumps on the horizon, dusty streets, rickety fences, and gun-toting citizens everywhere. Each of these elements is beautifully captured by cinematographer Giles Nuttgens (Dom Hemingway), as are the actual bank robberies and the quiet moments between brothers and Rangers partners. To cap it off, Nick Cave and Warren Ellis add a nice score and even better soundtrack … the best of which is an opening song from Townes Van Zandt . Mixed in with the impending gloom are some terrifically witty exchanges and some downright funny moments. Exceptional acting, a spot on setting, wonderful photography, and superb music are only slightly offset by the previously mentioned obnoxious and too obvious shots taken at big banks and oil companies. Sometimes a good story can be just that … and not a political statement. This entry was posted on Tuesday, August 16th, 2016 at 7:52 am and is filed under Drama, Thriller. You can follow any responses to this entry through the RSS 2.0 feed. You can leave a response, or trackback from your own site.